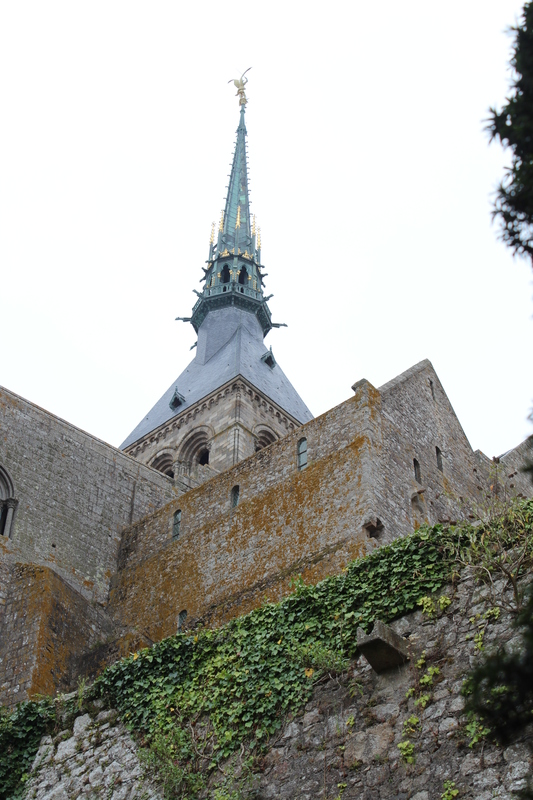 Mont Saint Michel has been at the top of my bucket list for a long time – and it doesn’t disappoint. From that first moment when it emerged from the haze above acres of open fields, both EB and I were captivated. 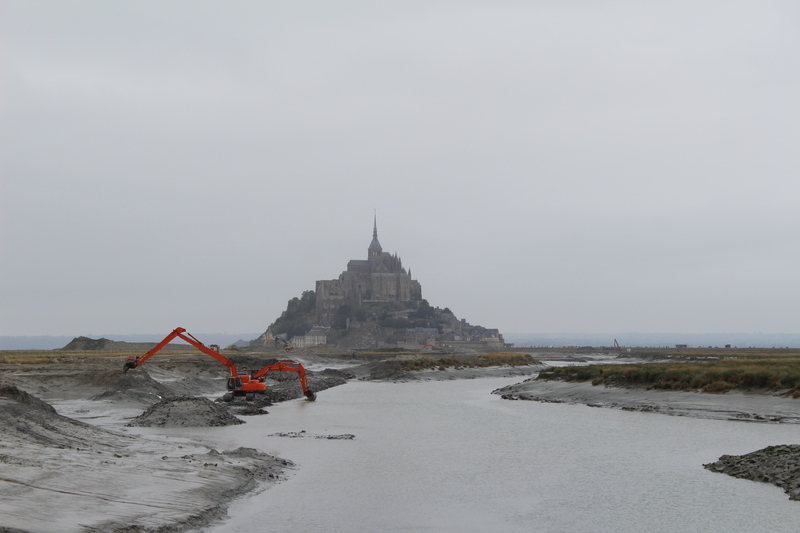 As we soon discovered, there’s a major restoration project underway to return the island feel to Mont Saint Michel – including replacing the causeway with a bridge so the water can circulate and removing around 1.3 million cubic metres of silt (i.e. ****loads) that’s built up over the years. Even with extensive work going on around it, and restoration on the Mont itself, it’s incredibly impressive. And the stairs… there are a lot. Once we got to the top, EB found a reason to go back down again (of course). Five minutes later, we just had to go back up because (apparently) the cathedral was open. It wasn’t, so we went down again for coffee. And he thinks I don’t know what he’s up to. Ha! Eventually, we went back up again to go through the cathedral – which is a bit like one of those dreams where you keep opening doors in your house and finding more and more rooms. Except these are huge, crafted from hand-hewn rock, perfectly melded with the rocky islet they rest on – and built at a time before cranes and other modern machinery. Phew. 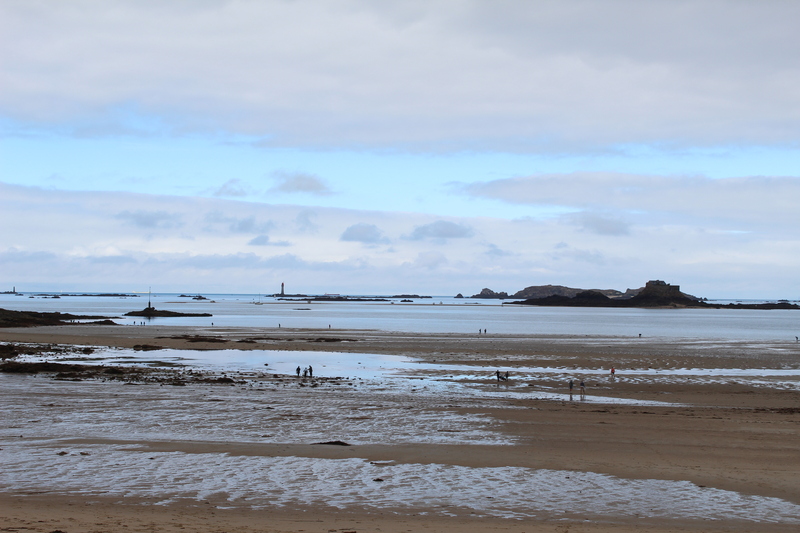 On the way back to our hotel in the walled-city of Saint-Malo, we took a detour to the resort village of Dinard. It’s another impressive ‘village’, this time on an island. The stone houses along the shoreline are huge and posh, but the amazing moment for us came when the locals turned out in force, armed with buckets and long pronged-metal spikes. They were on a mission to harvest the goodies from the seafood garden revealed at low tide – there for the taking, if you know what you’re doing. For some, this was a serious exercise, but for most I suspect collecting their seafood feast was as much about dinner as about hanging out with friends. Ah, France… what’s not to like? This entry was posted on Monday, September 17th, 2012 at 4:02 pm	and tagged with Brittany, Mont Saint Michel, Normandy, travel and posted in France, Travel. You can follow any responses to this entry through the RSS 2.0 feed.